There is nothing better than a comfortable family home that oozes sophistication and class. 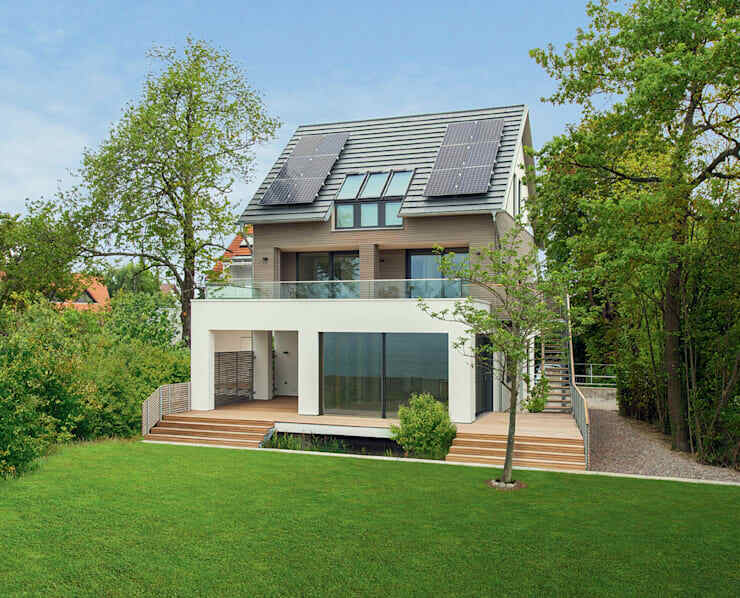 This is exactly what we are going to see now in the form of this German home, designed by professionals Bau-Fritz. This double-storey gem is eco-friendly and sustainable, while still holding all of the modern comforts of a beautiful family home. So often people think that living in a more eco-friendly home means living a more rustic lifestyle, but this is not the case. There are so many green homes on the market, which bring variety and diversity to the type of home that you can choose. These can be as basic or as intricate and lavish as you like. Today we are going to see an example of a modern family home that is as stylish and attractive as it is environmentally friendly. The first impression of this home is very chic and stylish. The home is two storeys high with a little attic peeking out at the top. Despite the height and size of this home, it's a very neat and trendy package that fits into the manicured garden beautifully. Don't you love how the trees line the garden? The facade is very neutral and subtle, finished in grey, white and a light wood. There is also glass interspersed throughout this home, which allows natural light to stream into the home. It also allows for a seamless transition between the interior space and the exterior space. We can also see how the eco-friendly aspects play a role, with the solar panels on the roof. These aren't an eye sore however, as they blend seamlessly into the grey of the roof. If head inside the home, we can see that the neutral colors persist. 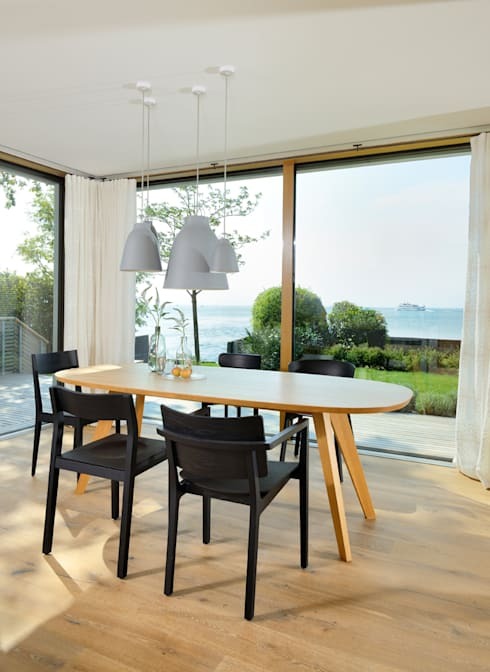 The white works beautifully with the light wood, creating a homely yet stylish, Scandinavian design. This little home office area is creative and trendy, featuring a gorgeous grey painting on the wall, a bookshelf packed with books and files and a neat little desk and chair. When it comes to a family home, it's always good to make the most of storage space, especially vertical space. Opt for bookshelves or shelves on the wall, which can store items neatly away without impacting on the floor space. They also add a stylish element to a home. The little twists in this home come in the form of gorgeous green elements, some of which are quite literal. 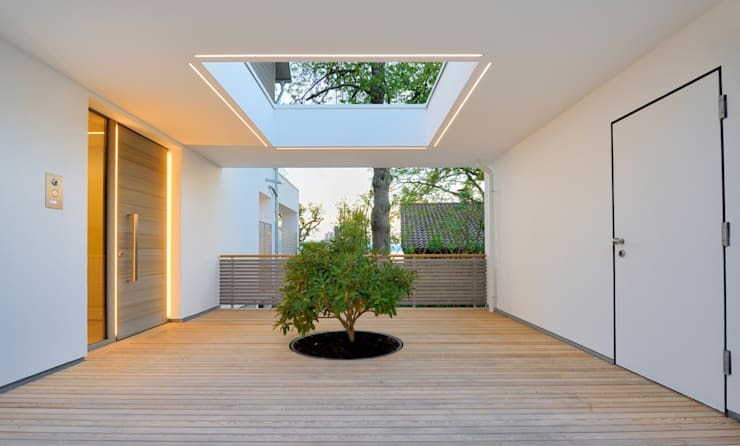 In this open space, we can see how the designers have included a little tree, which rests in a pot of soil that is sunk into the wooden flooring. There is a large glass skylight above the tree, which offers it plenty of light. This is a very innovative design. The wonderful thing about this is how it adds a subtle and natural form of the decor to the room. With the large glass windows, which add an abundance of light into the home, this is a very appealing design. Have a look at these other ideas to make your home more interesting. 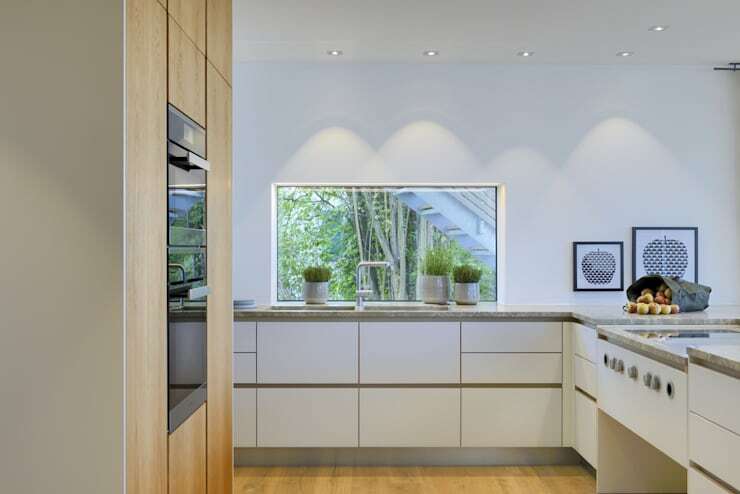 The kitchen is very sleek and minimalist with white kitchen cabinets and shelves, white walls and large glass windows that ensure that natural light filters into every corner of this family home. The white is offset by the light wooden floors and cupboards on the left, which bring a bit of warmth and soul into this stunning kitchen design. The designers have included little pot plants, which add that same sense of natural decor that we've seen in other parts of the house. This is a great tip for any room and can liven up a bathroom, bedroom, kitchen or even a media room! You'll notice that besides the plants, there are no items on the kitchen counters. Everything is packed neatly away in the storage spaces, keeping the kitchen looking sleek, trendy and minimalist. Have a look at these 6 smart kitchen storage solutions. Not only do the large glass windows and doors throughout this house allow for a very light and spacious home, but it also allows for panoramic views of the surrounds. In the dining room, we can see how the neutral colors allow the views to be the focal point of the space. The dining room lighting is one of our favorite parts of the home. The trendy lamps are different sizes and are suspended over the table, adding ambiance and functional lighting to the room. In the living room, we can see a bit of color has been added to the space, adding some vibrancy, personality and character to the home. The designers have opted for white sofas, which works with the light wooden floors and white walls. The brightly patterned cushions enhance the entire look and feel! The great thing about this is that if the residents want to change the color scheme in the living room, they simply need to swap out the cushions. 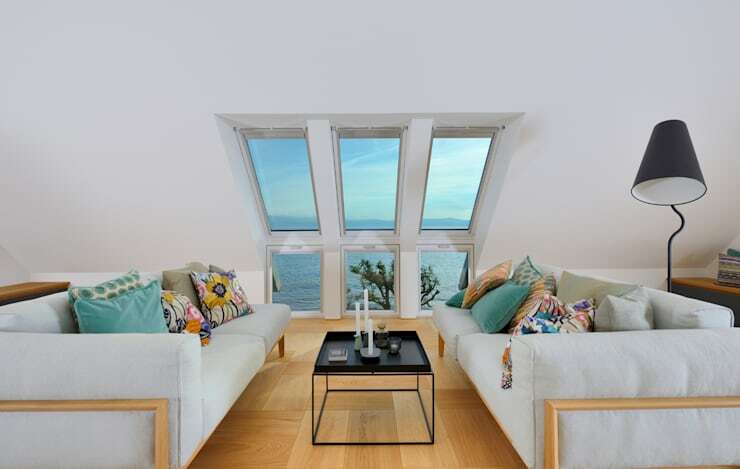 Don't you love the skylights, which give the residents views of the surrounds as well as some fresh air and light? The bedroom in this home is incredibly modern and stylish, opening up onto a very sophisticated bathroom. The raw logs of wood separate these two spaces subtly however, introducing that touch of green that we've mentioned before. This adds a rustic touch to the space, which works beautifully with the modern look and feel. 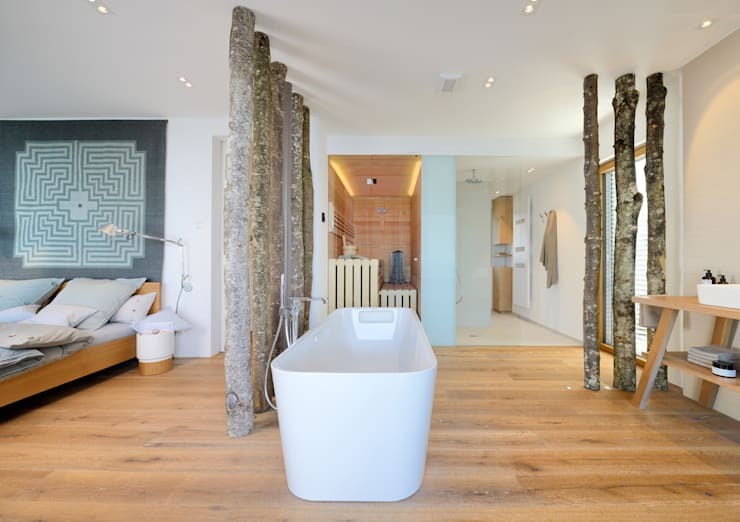 If you like this touch of raw materials in the home, you'll love this ideabook: make your home roar with raw materials. Tip: If you want a modern bathroom opt for modern features like a sleek tub and a toilet and basin that is suspended off of the floor. A bathroom can look brand new if you modernize these elements! We end off our tour on the patio, where a stylish living room set and sun loungers have been placed on a wooden deck, giving the family the most comfortable and relaxing outdoor spot to enjoy the views, entertain friends or simply relax with a book. 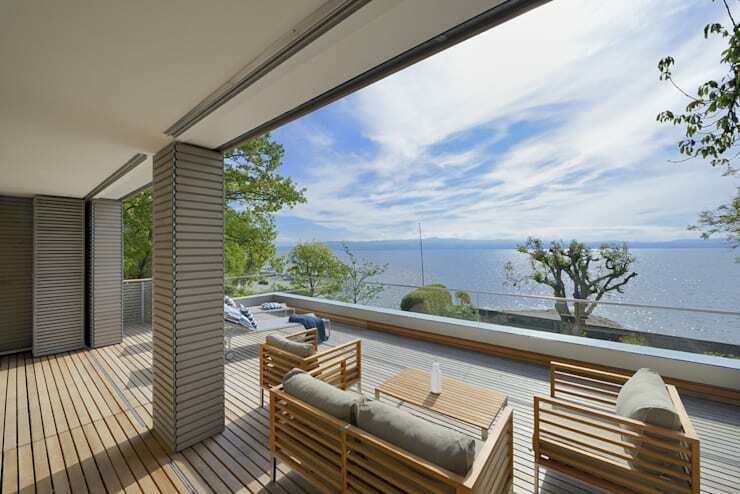 An outdoor space is very necessary for a family home as it extends the indoor living space. Not only does this create more space for family activities, but it also creates a space where the family don't have to be cooped up in front of the television. Can't you imagine doing a puzzle out here with your family members or enjoying a cocktail with your friends? If you liked this house, you'll love: The simple wooden home of sophistication.